Do you follow me on Instagram? Here is a sneak peek into my life beyond the kitchen. (1) Gorgeous cherry tomatoes from my garden. This large handful didn’t last long at all because they taste like candy. (2) While at the beach this past weekend, I grabbed a watermelon water to cool down. I definitely need to make this more often at home, so good and refreshing! (3) Key Lime Pie on a Stick – best thing EVER! (4) Guava Mojito – Another favorite that I need to recreate at home. I love the chunks of guava and fresh mint. (5) Red Snapper with Seared Scallops – the best dish that I’ve eaten in a while. I ordered this and baked oysters while we were dining at one of our favorite beachside restaurants. I’m still dreaming about this meal. (6) Emerald water and white sand – The gulf coast of Florida has the most beautiful beaches. (7) This seafood stew was Brad’s meal at dinner one night. We love seafood. (8) Fried Green Tomatoes – a southern favorite and so good! (9) Beach break – Brad and I celebrated our fifth wedding anniversary last weekend with a trip to our favorite place – 30a in South Walton County on Florida’s gulf coast. Pictures (2)-(9) are all from our weekend at the beach. We visited Seaside, FL. (10) Pictures from my spring garden – after a slow start, the garden finally flourished with melon, tomatoes, basil and zinnias. (11) For the past few months, Brad has been building a pond in our backyard. He did the entire thing himself and just built a beautiful bridge last week. It is almost complete and I will be sharing more pictures soon. (12) S’mores by the fire with strawberries is the best summer treat. (13) My first PopBasic order arrived and I was pleasantly surprised. I received a fun clutch, blouse and scarf. 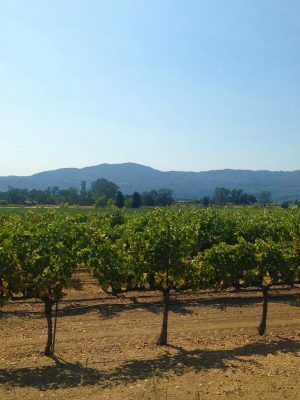 (14) We booked our fall trip to Napa Valley and Monterey California. I can’t wait and am looking for any and all recommendations for things to do, places to see and where to eat! (15) Plenty of red, white and blue in these Triple Berry Lemon Cookie Cups. (16) Fresh cut Zinnias from my garden. (17) My new Gigi New York tote arrived and it is perfect for summer. (18) Walking through the canopy of the trees one afternoon. (19) One of my favorite local spots has great food and a little garden patio that is perfect for enjoying the beautiful summer weather. Did I mention that they also have incredible dessert! (20) One of my favorite meals is this Coconut Chicken Curry. I make it more than anything else. 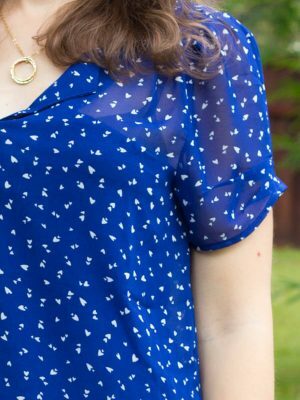 (21) My latest Stitch Fix arrived and it was full of full summer styles and colors. (22) Many spring and summer afternoons have been spent hiking through the woods. (23) Other afternoons has been spent relaxing in the hammock in our backyard. (24) Some days I am too lazy to make my own smoothies, but I am obsessed with the Kale-icious smoothies from Whole Foods. (25) Just a picture of a cute little kitty. Follow me on Instagram for more pictures of my life beyond the kitchen. I have plenty of food, fun and travel planned this summer and fall so follow along and don’t miss out! Love the collage you put together! 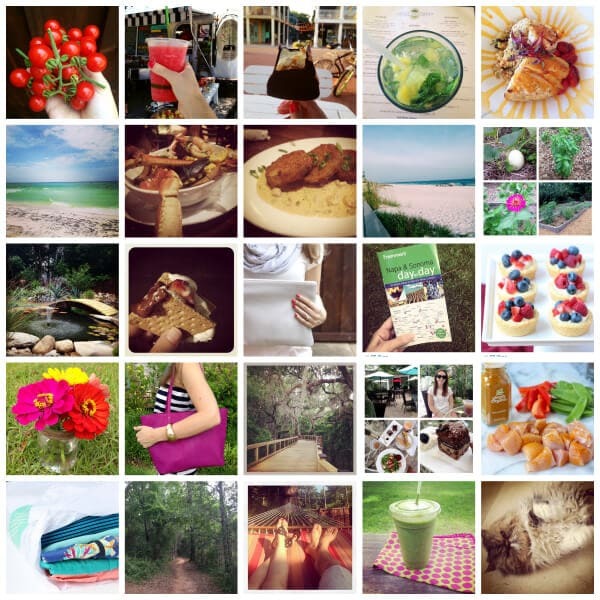 It's so much fun to keep track of what people are up to on Instagram! I love this look into your summer! Filled with lots of fun. I spotted that tote and was going to message you about it...but didn't want to feel stalkish. So glad you linked :) And boy does that beach weekend look relaxing!! Yes I clearly remember that key lime pie on a stick. I was in the middle of my juice cleanse when I saw it. It is everything I ever wanted. And so is your kitty. I NEED key lime pie on a stick!!! Fun pics Ashley! I keep meaning to make watermelon water at home - considering the amount of watermelon I've been eating you would think I would have done it already!And that's seriously impressive that he built a pond! And a bridge!! Me too! I bought another huge watermelon the other day and already ate every last bite before I could even make something with it. Ashley, this is such a fun little peek into your life! And also--key lime pie on a stick = mind blown. Amazing! Yes, the key lime pie on a stick is incredible. I'm pretty sure I could eat one every single day! That pond and bridge is beautiful! Your husband did an amazing job! Thanks, Meghan! I don't spend nearly as much time in it as I should. Loving this look beyond your kitchen goodies post - those Triple Berry Lemon Cookie Cups look insanely delish!